What has 26 million rows of data, more than 90+ trade agreements, in-depth profiles of the world's top 25 garment producing countries, and 20 years of clothing trade data? Answer: the new re:source suite of apparel sourcing tools developed by the team here at just-style. And best of all? It's now live. To get to this point we've also estimated it has also taken our design and development teams 17,000 man hours to get the product ready to launch, as well as a trip to the United Nations (UN) in Geneva to make sure we're using the most detailed global trade data we can get our hands on. So what is re:source, and why all this effort? 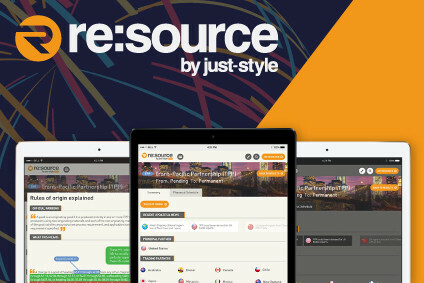 re:source is basically an online strategic planning tool designed to navigate the complex matrix of facts, figures, statistics, data, and knowledge that sourcing teams have to juggle every day in their quest to make the best decisions. We believe this is the first time all this information has been brought together in one single place – it's in an easy-to-use format, can be accessed immediately, and it will be updated constantly. It spans global trade rules and regulations, countries, regions and product categories. It brings together tariff and trade data, country profiles and risk assessments, a garment price tracker – and, well, provides everything you need to create strategic sourcing plans. There's also analysis from a panel of industry experts and just-style contributors to help put all this into context. And what makes it truly unique is that it's entirely focused on the apparel industry. We've been talking about re:source internally for the best part of five years, spurred by numerous conversations with leading executives at many of the world's biggest brands, retailers and manufacturers. They told us how hard it is to find reliable data and information on which to base current sourcing decisions and formulate future strategies. We've heard stories of the hours wasted researching trade agreements and tariffs. There's also frustration at the lack of reliable intelligence on which countries to source from. And the need for more transparent advice on how much to pay for different garments. On top of this, they wanted a tool that would be easily accessible anytime, anywhere; easy to understand; and, because everyone is unique, they wanted it in a format that could be personalised to meet their own business needs. So we set our sights on coming up with a solution...which we've called re:source. We've been testing it for the past 18 months and, as we've shared our progress along the way, new ideas, requests and opportunities have come to light. Many of these have already been incorporated into re:source, while others will be introduced as part of our longer-term development plans as the product evolves. But that's enough about where we've come from. More to the point, what are we offering, and what's in it for you? By combining country-level risk and capabilities insight with product-level trade flow and tariff information, re:source enables manufacturers and brand owners to make strategic-level decisions on where to manufacture different garments using existing local capacity, or by adding new facilities. #1: Apparel tariffs and trade agreements – Complex trade agreements, rules of origin, tariffs and schedules made easy. You can view and compare duties for a range of product categories across all countries and all free trade agreements in one place, with jargon-free guides to rules of origin, updated news and analysis. Data results can be exported and shared with colleagues, and customisable downloads and alerts set up for future reference. #2: Apparel trade data – See how the world sources. Track apparel trade flows between the US, Europe, Canada, Japan and the rest of the world – with values, volumes and average prices by country and region across a range of product categories. Again, recognising that everyone's needs are unique, customisation is also a key feature. #3: Sourcing country profiles – Create better sourcing plans by quickly and consistently comparing countries by key factors to find potential savings and identify potential risks. And because all re:source data is stored in the cloud, you'll be able to work wherever and whenever you choose. Here's a deeper dive into the tools and what they can do for you. Volume and value data – With 20 years of volume and value data covering all apparel imports into the US, Europe, Canada and Japan, re:source lets you identify the big sourcing destinations by HS code and garment category. Trade agreements – Our easy to search database covers 90 trade agreements, each with concise overviews, a look at likely changes and prospects, as well as phase-out schedule and exceptional rules of origin summaries by product. We also provide alerts on tariff and trade agreement changes and a roundup of relevant news and articles behind the data. Smarter sourcing – Prioritise sourcing countries by their main exports' average tariffs. And refine results using powerful filters like product function, category, materials and gender. Export data in bulk – Tariffs, volume, value and product price data can all be downloaded in bulk, ready to use in a spreadsheet. Monthly garment price tracking – We automatically track the average price of garments from category level right down to 6-digit HS code so you don't have to. Compare product data by country – Does your sourcing plan measure up? Compare different countries performance on price, volume (either weight or units) and value. Alerts when data is updated – Create and share alerts, dashboards and saved searches. Sourcing country profiles – We've taken the top 25 countries and rated them on 15 metrics like price, tariffs, compliance, quality, lead time, stability and innovation. Rank countries – See how manufacturing destinations stack up against each other to find savings and identify risks. Garment worker wages – Stay on top of changes in labour costs. Our country profiles let you track garment worker wages across all major sourcing destinations, so you can spot changes. SWOT including risk analysis – Back up your garment sourcing plans with an analysis of the the strengths, weaknesses, opportunities and threats (SWOT), political and currency risks for every key sourcing destination. If you'd like to find out how to create apparel sourcing plans that work for you, click here.